There are many ATV owners who enjoy riding their quads, but also like the advantages that UTVs provide as well. However, sticker shock from the higher prices is what keeps some quad riders from buying UTVs. 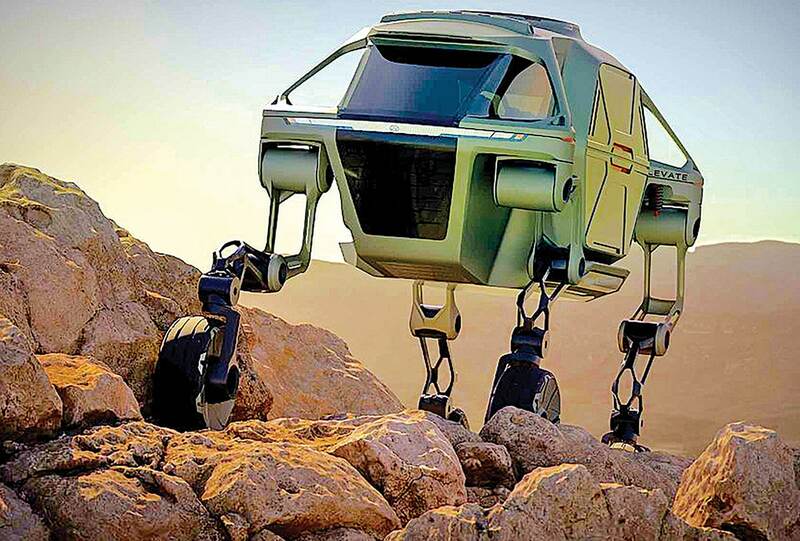 Well, Equinox has come up with a solution for the budget-minded with their add-on UTV trailer. You put the wife and kids in, hook it up to your quad, and off you go. The original Honda ATC90 looked quite different when development first began. Here we see how it started out with two tires in front and one tire in back. The riding position was very streamlined too. However, the whole concept was switched around when the test riders took it through the first mud hole. 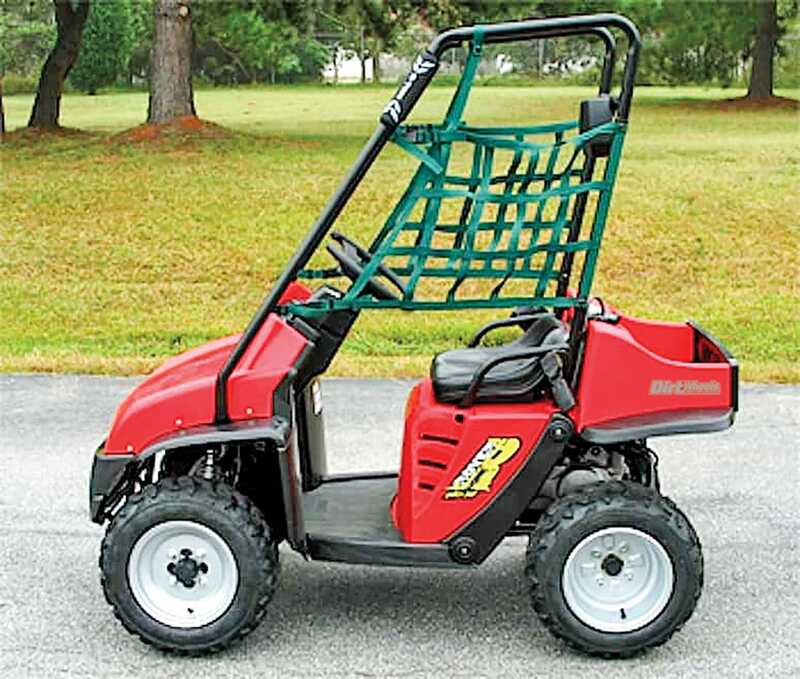 There are plenty of people who own sport quads, and most are not pleased with the fewer selections of new models to buy. Companies like Harley-Davidson are taking notice. With a drop in motorcycle sales these days, they’re looking to add growth in another direction. 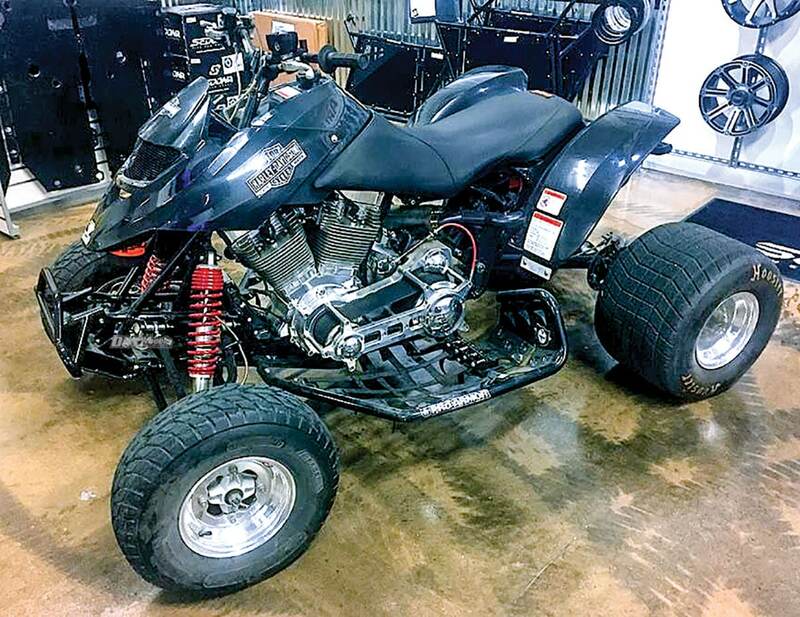 Perhaps this prototype Harley quad will make it to the showroom soon. Hyundai has noticed the large sales numbers of UTVs, and they’re now considering offering one of their own, too. However, they didn’t want it to be like all the others. 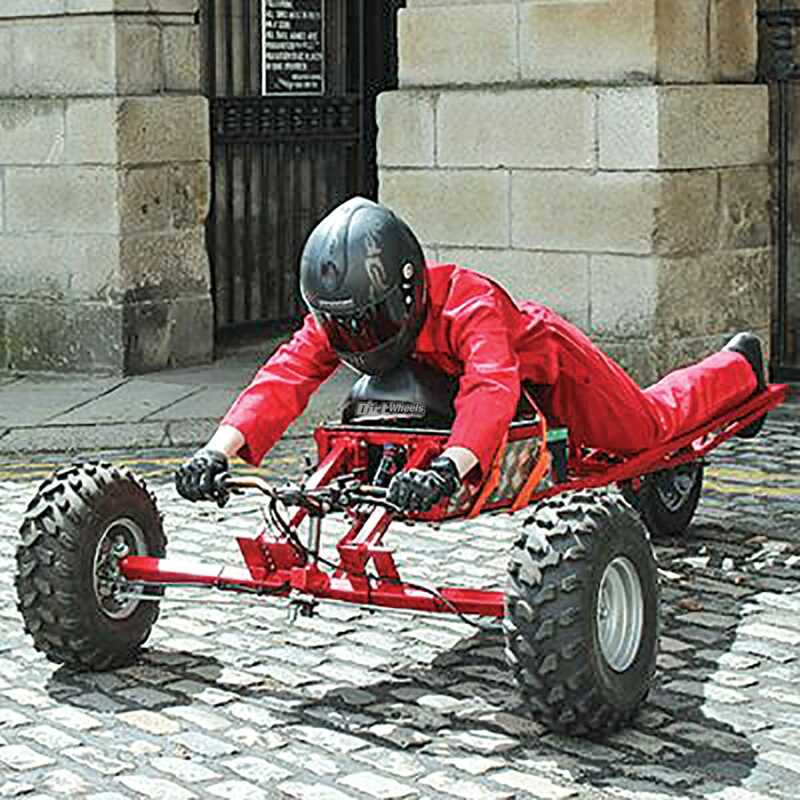 They wanted their UTV model to provide a unique ability. Their prototype model here is designed to step over obstacles. Stay tuned to the next issue when the Dirt Wheels crew may have a test of this wild machine. 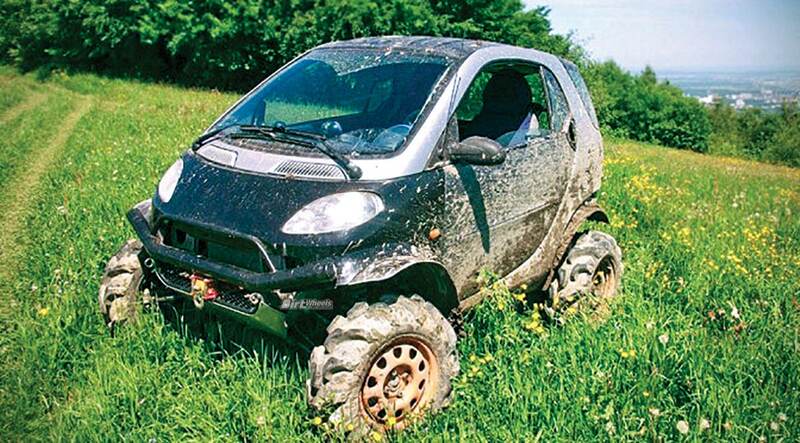 Instead of adding doors, a windshield and roof to your UTV, this Smart car has already done that for you. It’s their special UTV Edition that comes with off-road tires, fender flares and 2 more inches of suspension travel. It should be available at dealers on the 1st of April. As we all know, it’s smart to wear a helmet even when driving a UTV. However, there seems to be a number of UTV drivers who prefer to look less smart. Well, here’s a new helmet that will still allow them to look that way while protecting their heads at the same time. The park ranger probably won’t even notice the difference until after he pulls you over. Sears was the number-one retailer for many years, and it’s been sad to see them struggling recently to stay in business. One of the cost-cutting moves was to sell off their famous Craftsman brand. 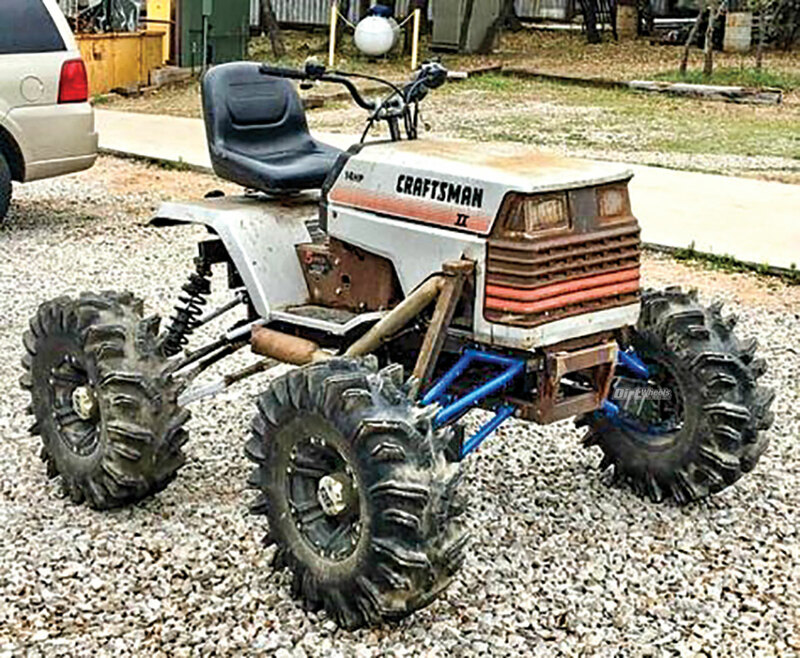 That couldn’t have come at a worse time, because Craftsman had just developed its new ATV that you see here. Perhaps this would have been the machine to turn things around for Sears. Unusually tall basketball players have always had a hard time fitting into vehicles, and that includes UTVs as well. Rover set out to do something about that. They now offer this new UTV model that they call the NBA Edition. The extra-high roll cage will protect the driver’s head no matter how tall he is. 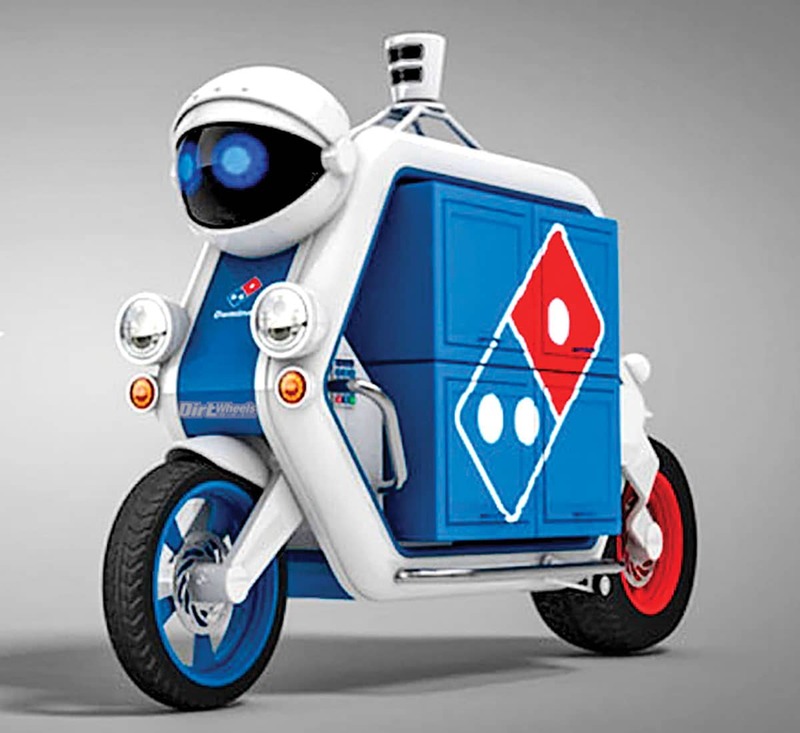 Self-driving vehicles are the latest trend these days, and even Domino’s has investigated using that technology for delivering its pizzas. This riderless cycle is designed to buzz quickly through traffic and get your order to you in a hurry. They also have a three-wheeler version for carrying extra-large pizzas. For even quicker deliveries, you can click the special wheelie option, which costs a little more.